Although we are still in the middle of summer, although it’s 92 degrees (33 C) outside and my feet are feeling bigger and bigger from the heat, I have this weakness lately for soups. Yes, soups. I can’t explain it but every time I see a new soup recipe I get all excited and run to the kitchen to start dicing, pouring and stirring. In the past two weeks, we had three different kinds of soups and I think my daughter is planning a strike along with her father behind my back. The funny part about it is that I used to hate soups when I was a kid. I always associate it with my mother praising the merits of her extremely hot vegetable soup to heal our cold and flue. “The hot soup will go through your veins and you will feel much better,” she tells us. We didn’t believe her story of veins, although it would have been funny to imagine it: “hot soup coming through! Watch out blood!” But still we really thought for years that it was our mother’s soup that cured us. Or maybe it really was! Now, I make soups because I love them. They are easy, comforting, always versatile, and did I say easy and quick to make. 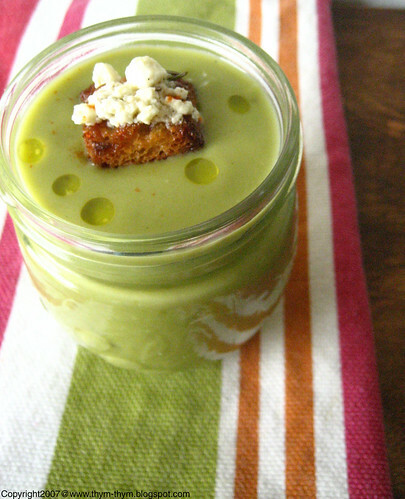 I made this pea, basil and feta soup a week ago when I spotted it on Wendy’s blog. It sounded so fresh and summery and Wendy’s writing about the sweetness of her garden peas convinced me even more to try it. Actually I didn’t need a lot of convincing. The soup is wonderful on its own but I wanted to add a little bit of crunch to it by adding some croutons and instead of using plain feta I used my favorite marinated feta, along with the olive oil that it has been marinating in. I added one potato to the soup because I wanted it to have more body. Wendy added the feta at the end but being a feta lover, I added half of it before blending it and added the rest on the croutons. This soup is already a favorite at home. It’s not only lovely but it also runs through your veins to cool you down and make you fell better. Trust my veins. In a Dutch oven, heat the olive oil. Add the onions then the garlic and let it cook until tender but not browned. Add the peas and potato and stir. Pour the stock or water and bring to a boil. Let it cook on medium heat, with the lid on for 15 min or until the potatoes are cooked through. Remove from the heat and add the basil leaves and stir. Leave the soup to cool a bit before pouring it into the blender. Add half the feta cheese to the pea soup and blend until smooth. Taste the soup then season with salt if needed and pepper. Brush the croutons with the olive oil from the marinated feta then broil for a few minutes until brown. Serve the soup with croutons, each topped with crumbled feta. Dans une cocotte, faites chauffer l’huile d’olive. Ajouter l’oigon puis l’ail. Laisser fondre mais pas brunir. Ajouter les petits pois et la pomme de terre et melanger. Couvrir de bouillon ou d’eau et porter a ebullition. Laisser cuire couvert, sur feu doux pendant 15 min ou jusqu’a ce que la pomme de terre soit cuite. Hors du feu, ajouter les feuille de basilic et laisser la soupe refroidir un peu avant de la passer au mixeur. Passer votre soupe au mixeur avec la moitie du fromage feta jusqu’a ce que votre soupe devienne veloute. Gouter la soupe et ajouter le sel si necessaire, car la feta est naturellement salee. Poivrez. 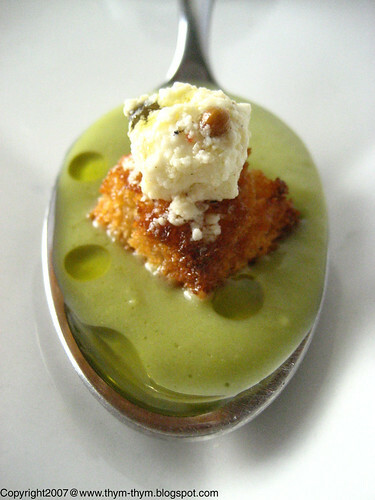 Badigonne chaque crouton avec l’huile d’olive ou la feta se marinait et mettre sous le grill pour quelques minutes jusqu’a ce que les croutons brunissent. Servir la soupe decoree de croutons et sur chaque crouton mettre le reste de feta emiettee. oh that looks wonderful! and i bet the flavors are divine. Thanks so much for the idea. Terrific photo. And I like your adaptation of the recipe. Yum, yum, yum, this looks beautiful! I love the combination of pea and basil. Of course anything a vibrant green color is welcome in the summer. Quelle jolie présentation! et une petite recette tout à fait estivale, ça doit être vraiment excellent avec des petits pois de bonne qualité. Rose, beautiful! I love soups, too, but haven't made anything too fancy these days (just the good old vegetable soup). Yours just made my mouth water! Looks delicious, maybe you should enter it to August Heat! Your photos are so beautiful -- but for some reason they are making me want to have this as a cold soup! Could it be because it's 90+ degrees here, too???? - thank you very much Ann. It was indeed very good. - Thanks a lot Nora. I had a great week. Still waiting to hear about your party. I am sure it was a hit. - Merci beaucoup Claude. Je dirai autant de ton art culinaire. - Merci Hilda. Malheureusement , la saison des petits pois est deja passee ici. Je les aurai utilise autrement. - Patricia, nohing beats a good vegetable soup to warm you up. Have a good weekend my friend. - Thank you very much Jerry. I won't miss this one. - Thanks a lot Nikki. You're right, short ingredients are always good for time and wallet. - Thank you very much Lydia, I guess you could have it cold but then wihout the potato or it will thicken more in the fridge and becomes lumpy. But you can have it at room temp like I did and it is perfect too for those hot summer days. J'ai loupé de succulentes recettes par ici, moi! - Merci beaucoup Samania et contente de vous savoir tous bien rentres. Soupe tres rafinee pour un beau petit diner en amoureux! Wow! This is WAY more impressive than my version. A wonderful adaptation. Proud that my soup inspired it! - Helene, je suis d'accord avec toi. - Wendy, I should give you the honors because without your recipe I wouldn't be able to make this soup. It really became a favorite.